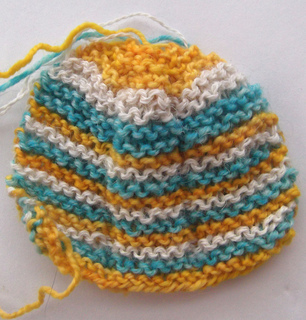 Sock Weight Version: Size 0-3 months (2.75 inches long unstretched) Shown in stripes. 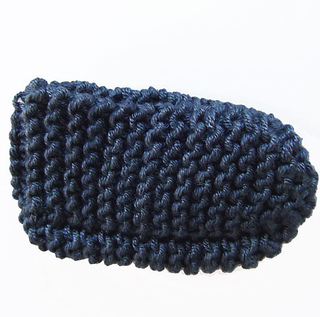 DK Weight Version: Size 3-6 months (3.25 inches long unstretched) Shown in gray and tweed versions. Easy knit square slippers in two sizes in sock and DK weight yarns. The slippers are knit flat in garter stitch and seamed. Slippers are a great way to use up yarn leftover from projects (and great to make a matching set to go with a hat or cardigan). 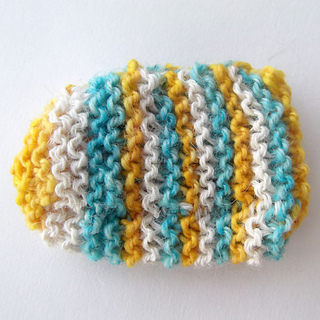 Size 0-3 months (2.75 inches long unstretched) Shown in stripes. 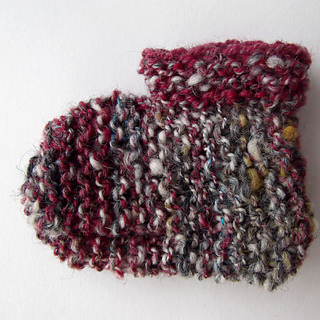 Size 3-6 months (3.25 inches long unstretched) Shown in gray and tweed versions. Note on fit: you want slippers to stay on the foot, so they need to be slightly shorter than the foot, they will stretch to fit. Sock Weight Version: 6.5 stitches and 12 rows per inch. 5.5 stitches and 10 rows per inch.